Audiobook Junkie, Sporadic book blogger, occasional master chef, soccer mom, wearer of pajamas, teller of tales, cool aunt, beloved wife, and loyal friend. Apparently decaying, brain devouring zombies are not terrifying enough for Mira Grant, she has to add parasitic worms to the mix. In a future imagined by Mira Grant, we have obviously become much more open-minded because people agree to ingest genetically altered parasitic worms into our system to guard us against common diseases. Unfortunately, the big money drug corporations are no more forthcoming with the truth about the dangers these parasites pose than they are in today's world. When the main character, Sally Mitchell, awakens from a coma in which she had been declared brain dead with no memories of her previous life, her miracle recovery is attributed to the healing properties of this parasite. Sally struggles with learning to function in society again, from finding her place within her family to understanding commonly used slang. She also has to accept, albeit grudgingly, being a lab rat for Symbogen, the company responsible for her miracle worm, since they are footing the bill for all of her ongoing medical care. When people suddenly begin showing strange symptoms of blank expressions, no nerve response, a kind of "sleepwalking" state, the scientists race to figure out what is going on and how to cover it up. But when it become too big a pandemic to hide and these "sleepwalkers" become less quiescent, blame needs to fall somewhere. Sally finds herself right in the thick of all the turmoil and not at all sure of who she should trust or if she should trust anyone at all. 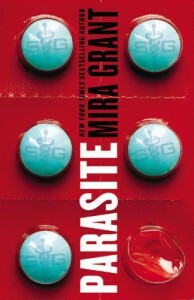 Parasite is a twisted medical/sci-fi thriller where the suspense slowly builds as more and more of the story unfolds. The tale is primarily told from Sally's perspective so the reader learns things as she does, and since Sally has some issues with analyzing social signals and reading between the lines due to her medical issues, she is sometimes a bit slow on making connections. This sometimes becomes a bit frustrating for the reader because things that may seem obvious, seems to go right over her head. Each chapter begins with excerpts from the biographies from the three scientists that created this parasite which gives some background on how this situation came to be. This helps a bit with the world building and gives some explanation as to how science convinced so many people to so enthusiastically ingest worms. I personally still found it to be too farfetched because even if a parasitic worm ate only fat cells and expelled cash, I still wouldn't so much as touch it, let alone swallow it! However farfetched, I still found Parasite to be satisfyingly creepy and several scenes made me physically cringe. The writing is detailed yet engaging. The characters are fully realized and each have their own agendas which become apparent as the story progresses. While the "big reveal" was something I saw coming from almost the beginning, the sub-plots within Parasite are enough to keep me invested in this series. The only real problem I had with this book, other than the idea of ingesting worms, is that it ended unexpectedly and abruptly. 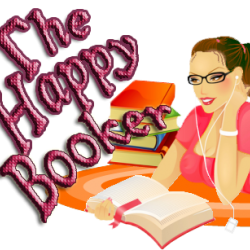 It wasn't so much a cliffhanger as it felt like someone just took the book away in the middle of a chapter. I am NOT a fan of endings without resolution.